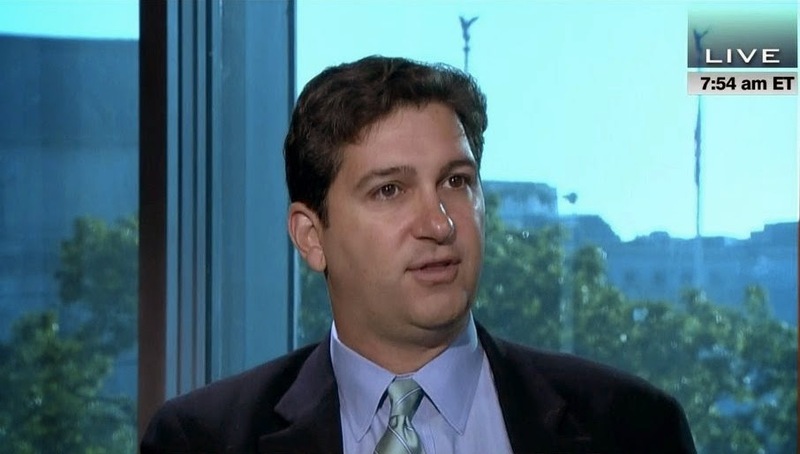 That reporter is Ken Dilanian, who has since joined Associated Press as an intelligence reporter. A swath of emails from the first half of 2012, released to The Intercept in response to a FOIA request, show that Dilanian maintained a particularly obsequious relationship with the media relations team over at the Central Intelligence Agency, the clandestine U.S. government service he was hired to cover for the paper. Dilanian, dubbed "the CIA's Mop-Up Man" by The Intercept, went beyond the usual role of mainstream media stenographer of government talking points. According to Silverstein - and overwhelmingly corroborated by the content of the published documents - Dilanian "enjoyed a closely collaborative relationship with the agency, explicitly promising positive news coverage and sometimes sending the press office entire story drafts for review prior to publication. In at least one instance, the CIA's reaction appears to have led to significant changes in the story that was eventually published in the Times." "I'm working on a story about congressional oversight of drone strikes that can present a good opportunity for you guys," Dilanian wrote in one email to a CIA press officer, explaining that what he intended to report would be "reassuring to the public" about CIA drone strikes. In another, after a series of back-and-forth emails about a pending story on CIA operations in Yemen, he sent a full draft of an unpublished report along with the subject line, "does this look better?" In another, he directly asks the flack: "You wouldn't put out disinformation on this, would you?" 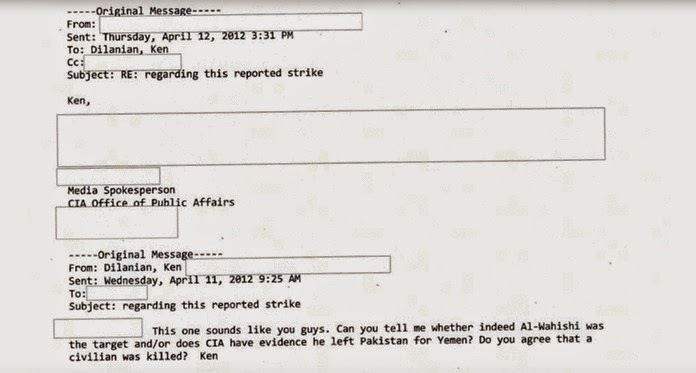 Another example of Dilanian's shameful sycophancy is found in an email he sent to his contact at the CIA Office of Public Affairs on April 11, 2012. In the message, Dilanian passes along a 10-day-old dispatch from the Yemen Times, reporting on a U.S. drone strike in Azzan, a town in the country's eastern Shabwa province. Five people were killed in the strike, one of whom was immediately identified as 60-year-old civilian, Mohamed Saleh al Suna. Six children were also injured by shrapnel from the bombing while playing soccer. Even though Reuters had already reported on the attack on March 30, 2012 - the day it occurred - Dilanian attempted to get confirmation on the strike and reported casualties from his buddies at the CIA. "This one sounds like you guys," he wrote, adding, "Do you agree that a civilian was killed?" Far from acting as a venerable "Fourth Estate" check on the excesses state power, Dilanian clearly revels in his access to the upper echelons of the security and surveillance establishment, eager to laundering their lies and whitewash their war crimes. While Dilanian's "closely collaborative" and "deferential relationship" with the CIA, as Silverstein puts it, is shameful, unprofessional, and does a great disservice to what should be the adversarial, critical, and challenging role the press should have vis-à-vis the government, it certainly comes as no surprise. A month before the first of Dilanian's emails released to The Intercept was written, I engaged in a brief online correspondence with him. On February 23, 2012, Ken Dilanian wrote a refreshingly solid piece on the U.S. government's view of the Iranian nuclear program, noting that there was still no evidence Iran is actually building a nuclear bomb nor actively pursuing the means to do so. Nevertheless, the article contained a slight error regarding Dilanian's shorthand description of Iran's declared and safeguarded enrichment site at Fordow, which he wrote was a "clandestine underground facility" that had been "discovered" by "Western intelligence agencies." Since the piece was otherwise generally good, I thought Dilanian would be receptive to a minor bit of fact-checking and decided to get in touch, using my nice voice. What happened next was bizarre. The defensive posture immediately on display by Dilanian - someone with an important role at a large American newspaper - was revealing, and illuminating. No amount of reasoned explanation or fact-based rationale would do - he deflected, doubled-down, fumed, fulminated, and then, as the short-lived conversation continued, became increasingly insulting and juvenile. He effectively admitted to being a sounding board for anonymous government spooks and berated anyone who doesn't have Pentagon and CIA officials on speed-dial as being ignorant and agenda-driven, citing a "conspiracy" I never suggested existed. The best part, perhaps, was when he wrote, "[T]here are checks and balances, including Congressional oversight, journalistic scrutiny and whistleblowers from within – all of which insures, I would argue, that US officials do not often get away with elaborate lies..."
My guess is that there are hundreds of thousands of Iraqis who might beg to differ with his particularly sunny assessment if they weren't already dead. At another point, Dilanian insisted to me that "U.S. government officials are not in the habit of elaborate disinformation campaigns," and then later, after I challenged the official narrative on something, writes, "but it's so easy for you to sit in Brooklyn, having no contact whatsoever with anyone senior from the government's national security apparatus, and having no real idea of how that apparatus works, and us[ing] phrases like 'a narrative emerges.'" With the new revelations published by The Intercept, we now know, even more than before and beyond a shadow of doubt, who's actually responsible for foisting particular narratives upon the unwitting public. But, hey, if only I sent fawning emails from Washington D.C. to my pals across the Potomac in Langley, maybe I'd have some clue as to what really going on. Thanks Ken, for setting me straight. I'm writing to thank you for the important piece, "U.S. does not believe Iran is trying to build nuclear bomb," in the L.A. Times today. It contains a lot of vital information that is not reported on nearly often enough in the mainstream press. Those who follow this issue closely, like myself, have been writing about this information for a long time, so reading it in the L.A. Times is a huge boost to getting the truth out. I do question, however, your decision to include the following sentence: "In 2009, Western intelligence agencies discovered a clandestine underground facility called Fordow, near the city of Qom..."
In fact, the Fordow plant was not really "discovered" by "Western intelligence agencies"; rather, it was announced by Iran to the IAEA on September 21, 2009. Barack Obama's sensationalist press conference, alongside Nicholas Sarkozy and Gordon Brown in Pittsburgh, during which supposedly "revealed" the existence of the Fordow facility to the world, occurred on September 25, 2009, four days after Iran itself told the IAEA about the plant, which was subsequently described as “a hole in a mountain” and “nothing to be worried about” by then-IAEA Secretary General Mohammed ElBaradei. In advance of Obama's supposed revelation, IAEA spokesman Marc Vidricaire told reporters, "I can confirm that on 21 September, Iran informed the IAEA in a letter that a new pilot fuel enrichment plant is under construction in the country." Obama even acknowledged this fact in his speech, noting, "Earlier this week, the Iranian government presented a letter to the IAEA that made reference to a new enrichment facility...", though he deliberately omitted the inconvenient fact that Iran is only legally obligated to inform the IAEA of new facilities within 180 days of the introduction of nuclear material thereby making his own accusation of Iran's alleged intransigence deliberately deceiving. In such an otherwise excellent report, it is frustrating to see the "secret Fordow facility" meme still repeated. Thanks for replying so quickly, Ken. That Iran was merely reacting to a Western discovery and hoping to pre-empt its publicity is precisely the narrative that has been wholeheartedly accepted by the press without any hint of scrutiny or shred of evidence. First off, how would Iran find out that Obama was going to hold a press conference announcing the "discovery" of the site with enough time to decide to "preemptively" draft a letter to the IAEA? - a declaration, it should be pointed out, that took place well before the 180 days before nuclear material was introduced to the site as mandated by Iran's ratified Safeguards Agreement with the IAEA. Actually, Iran announced the site about a year and a half before it technically and legally had to. I suppose, though, it is possible that Iranian agents had access to Rahm Emanuel's google calendar. The Clinton and Hague statements [that Fordo was "covert" and "clandestine" before revealed to the world by the West] recalled a briefing for reporters during the Pittsburgh G20 summit meeting Sep. 25, 2009, at which a "senior administration official" asserted that Iran had informed the IAEA about the Fordow site in a Sep. 21 letter only after it had "learned that the secrecy of the facility was compromised". That administration claim was quickly accepted by major media outlets without any investigation of the facts. That story line is so deeply entrenched in media consciousness that even before Clinton's remarks, Reuters and Associated Press had published reports from their Vienna correspondents that repeated the official Obama administration line that Iran had revealed the Fordow site only after Western intelligence had discovered it. But the administration never offered the slightest evidence to support that assertion, and there is one major reason for doubting it: the United States did not inform the IAEA about any nuclear facility at Fordow until three days after Iran's Sep. 21, 2009 formal letter notifying the IAEA of the Fordow enrichment facility, because it couldn't be certain that it was a nuclear site. Mohammed ElBaradei, then director general of the IAEA, reveals in his 2011 memoir that Robert Einhorn, the State Department's special advisor for nonproliferation and arms control, informed him Sep. 24 about U.S. intelligence on the Fordow site – three days after the Iranian letter had been received. An irritated ElBaradei demanded to know why he had not been told before the Iranian letter. Einhorn responded that the United States "had not been sure of the nature of the facility", ElBaradei wrote. The administration's claim that Iran announced the site because it believed U.S. intelligence had "identified it" was also belied by a set of questions and answers issued by the Obama administration on the same day as the press briefing. The answer it provided to the question, "Why did the Iranians decide to reveal this facility at this time," was "We do not know." Greg Thielmann, who was a top official in the State Department's Bureau of Intelligence and Research until 2003 and was on the staff of the Senate Select Committee on Intelligence during the 2009 episode, told IPS the evidence for the claim that Iran believed the site had been discovered was "all circumstantial". Analysts were suspicious of the Iranian letter to the IAEA, Thielmann said, because, "it had the appearance of something put together hurriedly." But there is an alternative explanation: the decision to reveal the existence of a second prospective enrichment site – this one built into the side of a mountain – appears to have reflected the need to strengthen Iran's hand in a meeting with the "P5 + 1" group of state led by the United States that was only 10 days away. The Iranian announcement that it would participate in the meeting on Sep. 14, 2009 came on the same day that the head of Atomic Energy Organisation of Iran, Ali Akbar Salehi, warned against an attack on Iran's nuclear facilities. The idea that Iran was planning to enrich uranium secretly at Fordow assumes that the Iranians were not aware that U.S. intelligence had been carrying out aerial surveillance of the site for years. That is hardly credible in light of the fact that the Mujahideen-E-Khalq (MEK), the armed opposition group with links to both U.S. and Israeli intelligence, had drawn attention to the Fordow site in a December 2005 press conference – well before it had been selected for a second enrichment plant. Anyway, whether you roll your eyes or not about this minor point of contention, my opinion, or Porter's conclusions, I do thank you again for your LAT piece and look forward to reading more from you in the future. I don't think it's particularly elaborate or dastardly for U.S. officials to establish a particular narrative regarding alleged Iranian intransigence and malfeasance. This one is actually quite simple - Iran legally places a new facility under full IAEA Safeguards in line with its obligations and, as a result, undercuts a big, fancy announcement by the president. So, in response, a narrative emerges that Iran did this deliberately because they had been "found out." And the press repeats that story until it becomes established, unquestioned fact. Anyway, no need to bicker about this. I'm glad to hear you have such confidence in the honesty of our government officials and think that they "do not often get away with elaborate lies." but it’s so easy for you to sit in Brooklyn, having no contact whatsoever with anyone senior from the government’s national security apparatus, and having no real idea of how that apparatus works, and uses phrases like “a narrative emerges.”; what you are saying there is that multiple people from multiple government agencies conspired in a big lie. you can’t make the accusation and then hide behind euphemisms. and what I’m saying is, we live in a democracy, it doesn’t (usually) work like that. not that people are so righteous, but that it’s impossible to orchestrate a conspiracy like that. there are 16 intel agencies, and a lot of other people with access to this sort of information, including liberal democrats and conservative republicans. even if obama and his advisers wanted to lie about something like this, some malcontent somewhere would talk. I chose not to carry the conversation further. After all, I had plenty of more sitting to do in Brooklyn, far far away from all those truth-tellers in the CIA press office. By the way here is the LA Times article that eventually ran about the Yemen attack. Wow, what a creep: shrill, aggressive, and condescending. Kudos to you for your insistent clarity, eloquence, and not stooping to Dalinian's level. Hopefully, this will severely tarnish him, and chasten places like the LA Times and AP who pay the salaries of people w/ views and attitudes like that. But I'm not holding my breath. No wonder mainstream institutions (esp. the press) are hemorrhaging credibility. What is Ken Dilanian's connection to Palantir Software? He recently published an AP article that is basically a press release for Palantir (and trashing the DCGS intel system). Does he have a client list?